Business Bible Wisdom: Perspective Business Bible Verse Wisdom: We see from a heavenly perspective as a business owner. Let’s look at I Peter 2:9 to see practical Business wisdom from the Bible. But you are a chosen people, a royal priesthood, a holy nation, God’s special possession, that you may declare the praises of him who called you out of darkness into his wonderful light. 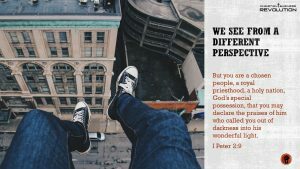 I Peter 2:9 Quick Wisdom from this Business Bible Verse: We see from God’s perspective. We don’t treat people the way the world treats them, we treat people the way God treats them. God tells us that we are a ‘special possession.” As we can see from this verse, we are chosen and we are a priesthood. If you take those concepts into your business you will see a big difference. You are a priest or shepherd for anyone in your business. That includes employees or customers. Being a priest means you understand who you are in Christ. Being a priest means you are continually connecting deeper to God personally. Being a priest means you are praying for employees, customers and community. Being a priest means you are leading spiritually. Realize you are a priesthood for God and pray for His direction. Create a list to pray for your employees, vendors, and customers. Create a schedule for your Bible reading so you can dig into God’s word. Create an open prayer time before the beginning of the day. Create a Bible study for after hours or during lunch. Business Bible Verse Wisdom: We see from a heavenly perspective as a business owner. Let’s look at I Peter 2:9 to see practical Business wisdom from the Bible. As we can see from this verse, we are chosen and we are a priesthood. If you take those concepts into your business you will see a big difference. You are a priest or shepherd for anyone in your business. That includes employees or customers. Caution: Make sure spiritual activities are not seen as mandatory in your business. Also be cautious about ‘favoring’ those that attend these optional studies.